Some of the newer sound decoders have a high "in rush" current and the older DCC systems may not handle the load when attempting to program some sound decoders. This is true for Broadway Limited locomotives (BLI) and Soundtraxx Tsuanmi sound decoders among others. Digitrax has released an upgraded power supply. I use Lenz and, so far, it has handled all the chores. However, when I purchased a Soundtraxx light steam decoder for my Bachmann Spectrum 2-8-0 from Tony's Train Exchange they recommended that I also buy a PowerPax booster. The PowerPax safely boosts programming power to load the capacitors and prepare the decoder to accept CV changes. It was an easy installation. Two wires from the programming terminals on my Lenz system go to the PowerPax on the top left and two wires exit from the right top terminals to the programming track, ie, it's connected in series between the programming track output of your DCC system and the programming track. The PowerPax gets its power through a DC connector that's plugged into an AC outlet. As it's a small unit I mounted it with two-sided sticky tape next to my programming track. The booster is recommended for use with Lenz, Digitrax, MRC, NCE and other DCC systems. Tony's tested it with single and dual sound decoder configurations using Broadway Limited, Digitrax, Lenz, MRC, NCE, TCS and Soundtraxx decoders. It is also compatible with JMRI's Decoder Pro and RR & Co Train Programmer so it can be left permanently hooked up to your programming track. The PowerPax has a red LED on top. If the LED is brightly glowing everything is OK. If it's flashing there's a short. 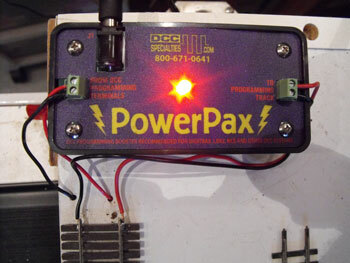 The PowerPax should never be connected to the DCC track output or used in Operations Mode. It will be severely damaged. Fortunately, I decided some time ago to keep my programming track completely separate from my railroad. I originally had a siding that did dual work for programming or live use through the flick of a DPDT toggle with center off. I was always uncomfortable with this arrangement figuring if the siding was being used for operations and had cars positioned on it. I didn't want to start moving rolling stock or other engines every time I wanted to program a locomotive. The programming function shuts down the entire layout in Service Mode so what's the point? It's a little awkward to always put a locomotive for testing on the programminh track, but a locomotive probably has its shell off and there are wires and speakers and capacitors hanging down. This method guarantees that nothing inadvertently touches live rails. It happened to me once. Once was enough. If you have a double duty track for programming, Tony's suggests putting a dead section of track as long as your longest locomotive between the live track and the programming section of that track. Again, this defeats the purpose of using that length of track unless you're using idler cars or something. I'm glad I decided to avoid the whole issue. One other suggestion. Tony's Train Exchange found that adding a 12 ohm 1 watt resistor between the output terminals of the PowerPax and the programming track (in series) helped reading and writing CVs for BLI switchers, and the Proto GP9. If you're having problems changing CV values for any of your sound decoders, check out the PowerPax programming booster. It only takes a couple of installs to pay for itself. Go from "programming-booster" to sound installation tips.